Those of us who do our own work on our boats face a host of safety issues. Not the least of these is protecting out hands. Paints, solvents and sensitizing chemicals are prevalent. Repeated or prolonged use of many of the solvents in these products can remove skin oils, producing dermatitis (dryness, irritation, redness and cracking of the skin. Exposure to uncured epoxy can cause the user to become sensitized to the epoxy. Once that happens, you will never be able to use epoxy again..
Just found out that we were mentioned on the Boat Insurance website. 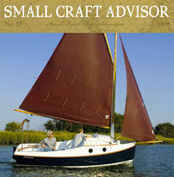 It looks like a great site for information about boat insurance and boating safety. It's important to remember that boat insurance is nothing like auto insurance, for example. Each policy has different provisions and its important to understand them. Got an EPIRB? Better check your registration code! If you have an EPIRB, check the registration on file with the one on your unit. While the investigation is ongoing, it appears that the registration code error was entered incorrectly by the registration clerk.